Hillsboro’s Josh Keets (24) runs the ball against the Washington Blue Lions while fellow Indian Luke Middleton (81) blocks for him on Friday at Gardner Park in Washington Court House where Hillsboro took on Washington in FAC football action. WASHINGTON C.H. 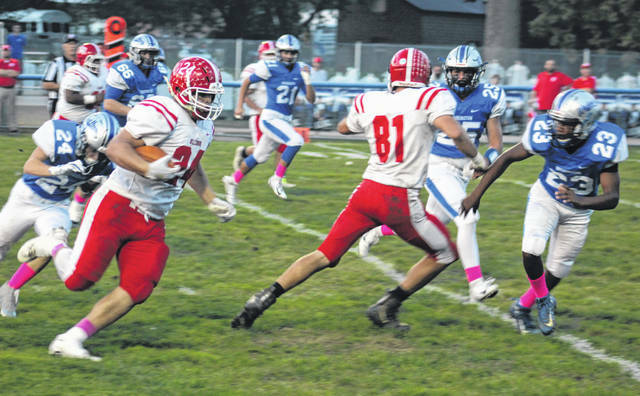 —The Hillsboro Indians crashed the Washington Blue Lion’s Homecoming on Friday at Gardner Park in Washington Court House. https://www.timesgazette.com/wp-content/uploads/sites/33/2018/10/web1_Hillsboro-vs-Blue-Lions-football-10-5-2018.jpgHillsboro’s Josh Keets (24) runs the ball against the Washington Blue Lions while fellow Indian Luke Middleton (81) blocks for him on Friday at Gardner Park in Washington Court House where Hillsboro took on Washington in FAC football action.